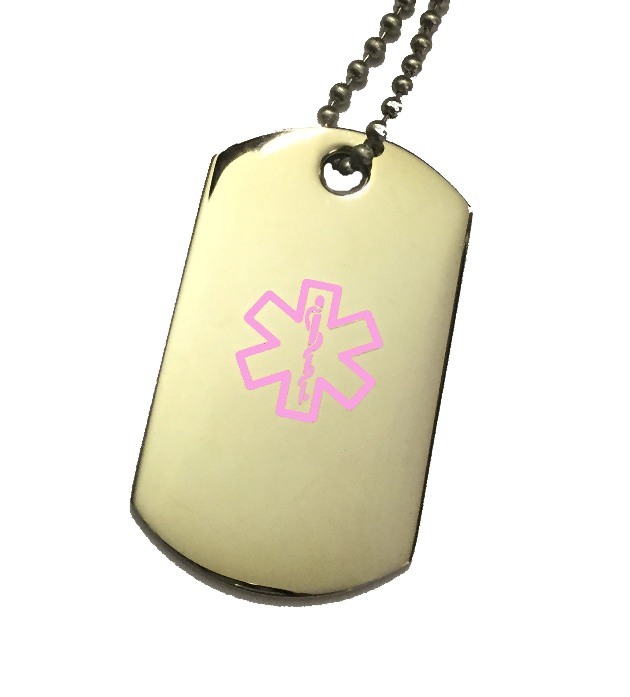 Stainless steel dog tag pendant with hot pink medical ID symbol. Measures approximately 1 x 1 7/8 inches. Choose a stainless steel chain or a colorful rubber necklace. Other colors and necklace sizes may be available by request. I sent for this pendant with great expectations. The pendant was good quality and engraving was good. However, the chain was way too small for an adult so another one had to be purchased adding to the cost. As well, I didn't realize how large the pendant would be and would have preferred something smaller, especially when you have to wear it everyday. 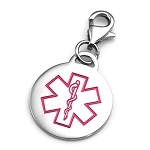 Elegant Medical Alert: Thank you for your feedback. I'm sorry that you had to purchase another chain for your dog tag pendant. If you can send us the receipt for it, our finance department may be able to reimburse you for the extra cost. 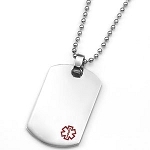 Regarding the size of the pendant, it's true that this is one of the larger ones we carry.